Be safe when you enter and exit a bathtub with a grab bar installed on the curb. Find out the proper ADA height and placement for grab bars in a bathtub. Installing bathtub grab bars is a smart safety measure whether or not a member of the household is elderly or disabled. Grab bars provide extra support in areas that are known for accidents such as the bathtub and other slippery locations. A bathtub grab bar can make getting into or exiting from the tub or shower stall much easier; allowing a person to have a secure way to balance themselves while lifting each leg into the tub area. For individuals, such as senior citizens and those with a physical impairment, who can lose their balance easily, a bathtub grab bar offers a steady rail which can support a person’s weight. Adding a handicap shower chair nearby a tub grab bar creates a landing spot to be used as an additional steadying point. 16 inch Bathtub Grab Bar – non slip rough surface for extra firm clamping. Sturdy Bathtub Bar – simple to use, screw handle that clamps onto the curb of your bathtub. 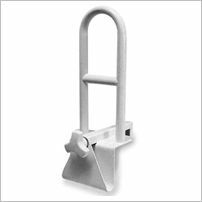 Strong Clamp Tub Rail – curb grab bar able to support 300lbs of force. Tub grab bars clamp on to the curb of the bathtub using a tightening design. The clamps are lined with rubber padding that will not put holes or scratch the surface of the bathtub. The tub bar works by twisting the large screw until it tightens. The grip of the rubber and the clamp keeps the grab bar safe and secure. Grab bars can be installed on the bathroom or shower wall so that the positioning can suit either a person desiring to grab the bar with their right hand or their left hand. Before deciding on a bathtub grab bar configuration, stand outside your tub and visualize the most comfortable position. Imagine where your dominant hand would be situated when entering the shower or bathtub. The dominant hand is the one you would use to steady the movements. Make sure the grab bars cannot rotate within their installations. There should not be anything sharp or abrasive nearby. 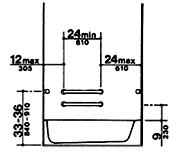 Edges should be smoothed out with a minimum radius of 1/8 inches. Height of the grab bar should be 33 to 36 inches above the floor of the bathtub. With a customized installation of a shower grab bar, be sure to double check the placement and height most convenient for their personal use. Permanent installations of grab bars should support at least 250 pounds of pull. These bathtub grab bars must be properly anchored into the studs located in the handicap bathroom wall. A stud finder and drill is necessary if you intend on doing the grab bar installation yourself. Concrete walls, fiberglass or hollow walls might require special instructions to properly anchor the bar securely in place. A bathtub grab bar is just one of the ways to start ensuring your bathtub is a safer place. This is what you put in a bathtub that is slippery but it is only the beginning. For added protection and safety for the slippery bathtub floors, add a shower mat that is anti-slip, non-skid and can grip the floors. Simple grab bars can cost $20 to $50 while higher end models cost between $75 and $100. Bathtub grab bars make an excellent, affordable investment in household safety and peace of mind.